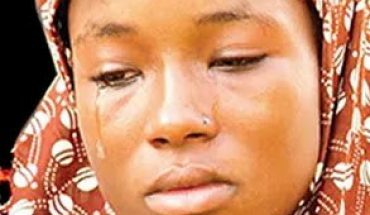 Christian Girl Married Off To Boko Haram Commander Cries As Snake Kills Her Baby, Wants To Return To Husband In Sambisa Forest“I Want To Go Back To My Husband In Sambisa Forest” – Christian Girl Forced To Marry Boko Haram Commander Laments. A teenager identified as Zara who was abducted by Boko Haram but was later rescued by the Nigerian Army has expressed her willingness to join the terror group because of the stigma she is now experiencing after she was reunited with her family. This is just as Ahmad Salkida, a journalist known to have unfettered access to Boko Haram, said that the government’s decision to close down the Chibok school was a sign of victory for the terror group since their plan was to discourage western education. However, the story of Zara (not real name), who is a 17-year-old girl, is one among the myriad of young girls, whose lives have been “cut short” by the invasion of the sect in various communities in the North-East. Recounting her ordeal in an interview with the British Broadcasting Corporation (BBC), Zara said she was kidnapped by the Boko Haram and then freed by the army, a development that had made her sometimes wishing she were back in the forest (Sambisa) rather than suffering the stigma as a Boko Haram “bride”. Though unconfirmed if she was one of the missing Chibok schoolgirls, Zara said until now she didn’t have her own social media hashtag, but like thousands of others – free or still captive – she is deeply traumatised. In telling #ZarasStory, being the first time she was speaking to outsiders about her “terrible experience” a year on, and the pain she still suffers to this day, Zara said: “They gave us a choice – to be married, or to be a slave. I decided to marry. One of the militants had once told her: “You are only coming to school for prostitution. Boko (Western education) is Haram (forbidden) so what are you doing in school?” But as she continued in her narration, there was so much confusion in her face and in her answers even though she claimed not being a killer, but just a child. Continuing, Zara said: “The feeling for the forest is strong now, but it will go away. I will forget the time with Boko Haram, but not yet.” She said she was in love with her husband although she believes she had been brainwashed, a development which made her feel abandoned by her faminily and stigmatised by her community. While she lamented the precarious state in which she had found herself, it became so obvious that there was little or no difference in her story, except for the fact that child she was soon to bear a child. Collaborating her story, her uncle, Mohamed Umaru, said: “Life was tough and dangerous. The air force jets bombarded the vast Sambisa Forest where the militants have their camps and from where soldiers rescued her and eventually returned her to her relatives. “The women in our family realised she was three months pregnant. In our family it happens that some of us are Christians and some are Muslims. She was a Christian before she was kidnapped but the Boko Haram who married her turned her into a Muslim.” On whether to give birth to the unborn baby or not, Umaru said there was a split in the family over what to do and they took a vote as to whether she should abort or keep the child. The majority prevailed and she gave birth to a boy. “She said her husband’s father is called Usman, so that is how she named the child,” Mohamed said. Immediately “Usman” was born, according to him, the insults began. “People call me a Boko Haram wife and called me a criminal. They didn’t want me near. They didn’t like me,” Zara said as a tear slowly slipped down her cheek. She now sits inside the small walled compound around her house, afraid to go outside because of the cruel insults of the neighbourhood children – messages of hate learned from their parents. “They didn’t like my child. When he fell sick nobody would look after him,” she said. To justify this fact, Zara said last weekend, as she slept outside with “Usman” who was just nine months old because of the heat, a snake got into their compound and the boy was killed. She stated that half of the family celebrated what they called God’s will. “Some were happy that he died. They were happy the blood of Boko Haram had gone from the family,” Zara said. “They said thank God that the kid is dead, that God has answered their prayers. Sometimes she says she wants to go to school and become a doctor and help society, but sometimes, when people insult her, she says she wants to go back to the Sambisa Forest. “She always talks about her husband who happens to be a Boko Haram commander. She says the guy is nice to her and that he wants to start a new life with her,” Mohamed explained. Listening to Zara’s story, told quietly with eyes flicking down at the ground, it is hard to imagine anyone going through what she has gone though, let alone a 17-year-old girl. Previous Post:The Ashawo I Met is Sweeter In Bed Than My Wife, Should I Dump My Wife?